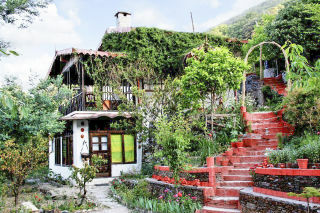 Situated a good 15 km away in the pristine outskirts of Nainital in Pangot, and nestled before a rich landscape crowned by mighty oaks, fragrant pinewoods, and rhododendron forests, this cottage is an abode of homely comfort and rustic old-world charm. Rough-textured clay stairways give way to pastoral interiors comprising a raftered ceiling in unvarnished teak and predominantly white walls. 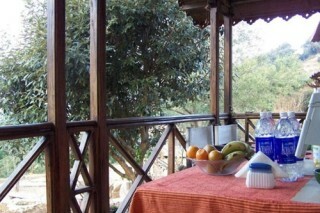 The bedroom on offer is sectioned into a loft and base, each of which is well-furnished with a comfortable double bed. 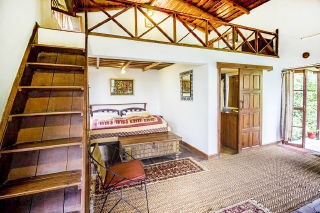 While the base has an antique trunk coffee table and an oriental carpet dressing it up, the loft is done up more intimately with writing desks, a vintage coal-fired room heater, and homely mats. It opens out onto a balcony with a gorgeous view of the pinewood landscape, where a dinette can be set up for an al fresco lunch in the privacy of your room. The shared dining hall creates the perfect space to meet fellow houseguests over a shared appreciation of food. 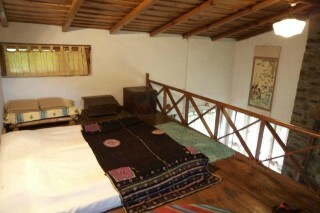 Up to three guests can spend a relaxing sojourn here! 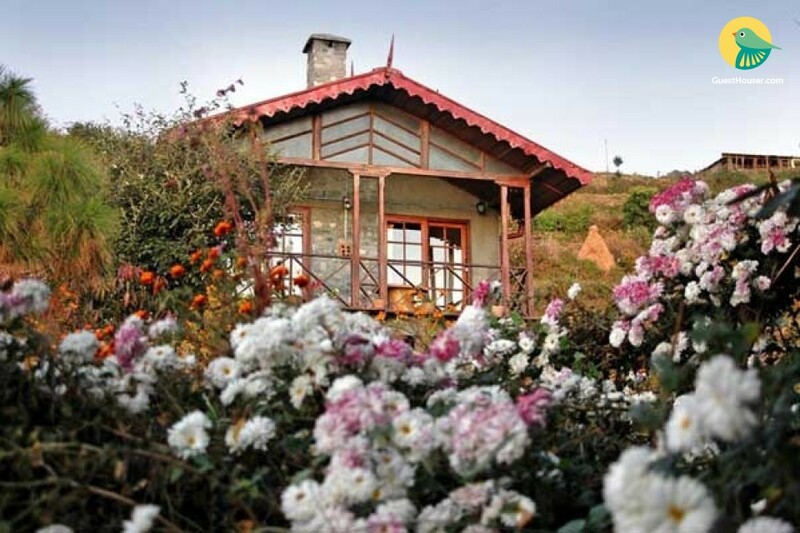 One of the cottages is a living room that serves as a common dining hall giving travelers a chance to meet other like- minded nature lovers. Guests are requested not to walk alone at night, Members of our staff will be happy to accompany guest back to their cottage / rooms. Please do not walk barefoot anywhere, not even inside your rooms. The activities here are numerous and most of them can be availed at a cost as specified at the property. We suggest you book them in advance with us. *Bird Watching- More than 250 species of birds have been recorded in the area.We arrange for the services of a bird guide. *Treks- Day treks are organized for individuals, small groups and families with picnic lunch.We arrange for the services of a trekking guide. *Boating-Nainital, which is just 15 km away from Pangot, is famous for boating. Yachts, paddle boats and rowing boats are available on hourly basis. *Horse Riding- Horse riding is one of the most interesting activities in Nainital to visit scenic spots such as Dorothy Seat, Land's End and Tiffin Top. Three day horse riding tour is conducted from Corbett Park to Pangot. 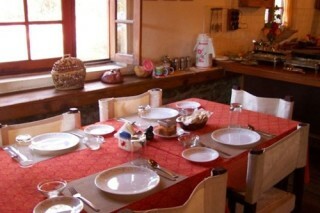 *Cooking Class-We are happy for you to interact with our chef. We can arrange a free cooking lesson and you can share your favorite recipe with us too.